Peaceful Playgrounds | Recess Doctor Blog: Are Dirty Children Smarter? Research published in the American Society for Microbiology indicates that dirt as actually beneficial for children and can affect then cognitively in a positive way. 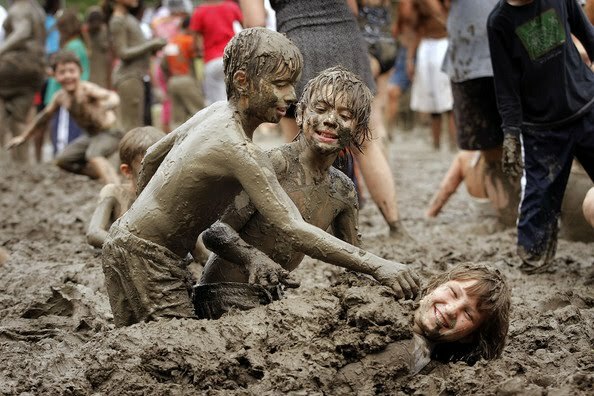 In the age of hand wipes and Purell parents and teachers can finally let their children experience the value of playing the dirt. The research indicates that children who play outdoors can inhale a soil-borne bacterium that has positive effects on cognition. These bacteria can increases levels of serotonin, reduce anxiety and may also stimulate growth in certain neurons in the brain. The report seems to validate that when you add natural features to play environments you reap the benefits of not only engaging play environments but also dirt and the benefits that come with it. Many parents shudder at the thought of their child covered in mud and dirt and the millions of bacteria they are exposed too, and for the most part they were right. But actually it is not the harmful bacteria that they need to worry about but instead now they can breathe a sigh of relief at all the benefits of dirt. It is not only ok to let children get dirty from a healthy standpoint, but from a developmental standpoint to helps children experience the world experientially and better engages them with play. So take of your child’s Sunday best cloths and through on some torn jeans and stained shirt and let them get dirty. It may actually make them smarter.